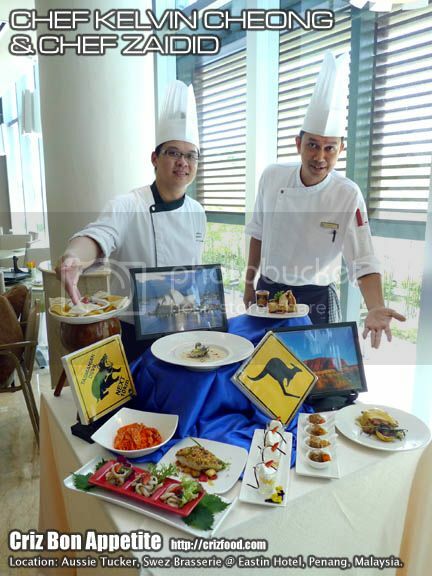 Swez Brasserie @ Eastin Hotel, Penang, would be having its Aussie Tucker Promotion for the whole month of January 2013 (1-31 January 2013). 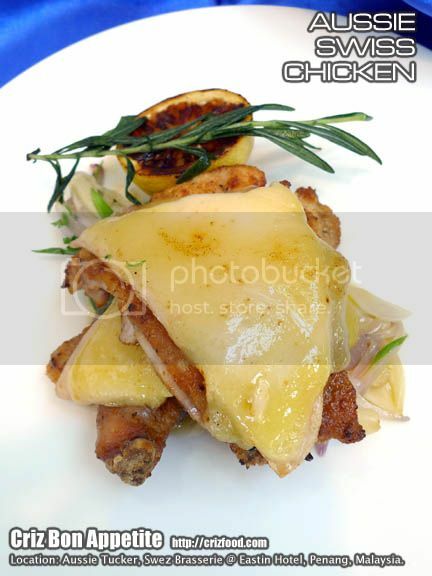 This promotion would be under the skillful hands of the Jr. Sous Chef, Chef Kelvin Cheong with the help of Chef Zaidid. As Australian cuisine has the influence of globalization from different nationalities, the Aussie Tucker may include just anything from sandwiches, rolls, wraps, salads, hot from the oven to snack treats. 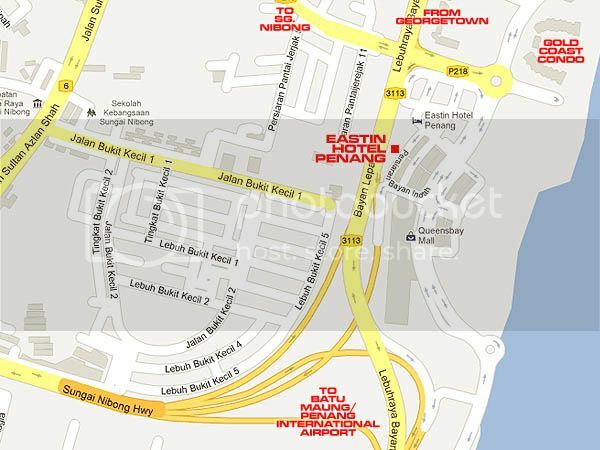 Please note that there will be a 15% discount for all MAYBANKARD, Standard Chartered Bank and VISA card members. More details below. 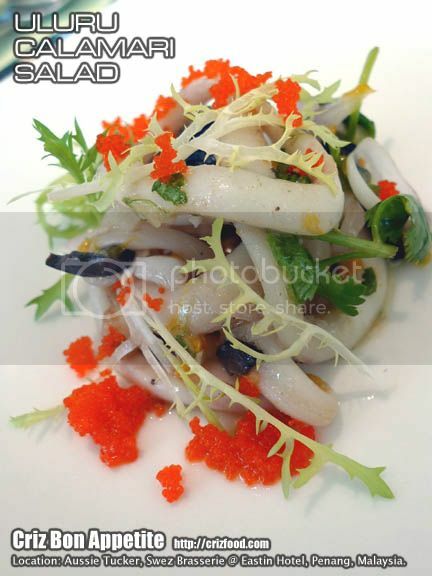 We started with some appetizers namely the Uluru Calamari Salad (烏魯魯魷魚沙拉). Named after the famous sandstone rock formation in Australia that was formerly called Ayer’s Rock in Australia, this simple yet fulfilling plate of salad had amazed me. It had slices of cooked calamari tossed with some chilies, grapes, frisee and bits of fresh orange with some walnut sauce. It was simply refreshing as an appetizer. Next was the Chiko Roll (澳式雞蛋卷). The first impression I had was that of our local Spring Roll (Choon Piah/春卷) but the filling was rather unique with lamb filling almost similar to the taste of shepherd pie filling. 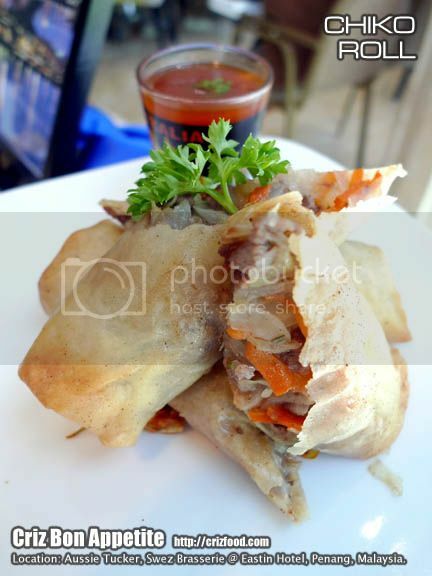 Each roll had chunks of lamb, cooked with celery, carrot, and onions in stock reduction and wrapped with spring roll sheet. It went well with the accompanied spicy sweet sauce and lemongrass chili condiments. 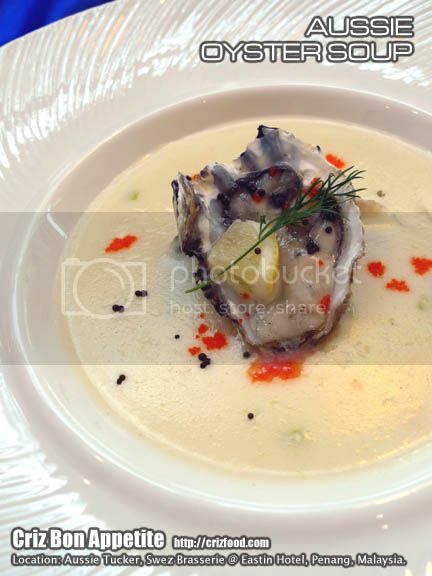 We also had some Aussie Oyster Soup (澳洲牡蠣湯) with slices of lemon to pep up the fresh oyster flavor. Though the soup was creamy with a significant usage of flour as thickening, it lacked the sweetness from the added carrot, celery and onions. It was rather bland at one point without the addition of salt and pepper. I guess the kitchen has to improve further on the usage of relevant stock for this dish. The soup had some ebiko and monk fish caviars as garnishing. 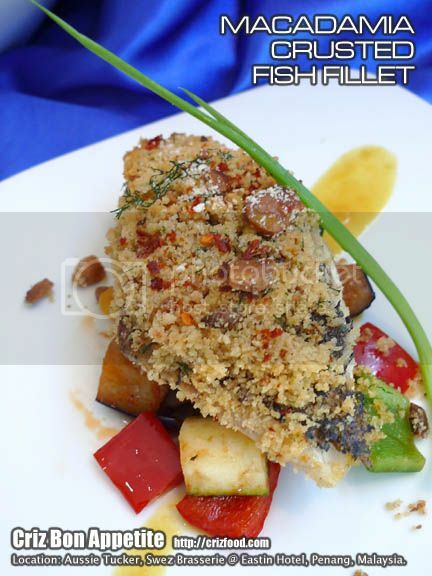 As for the main course, we had Macadamia Crusted Fish Fillet (堅果酥脆魚片) served on a bed of Ratatouille with Ham, dressed with orange ginger sauce. The choice of a thick slab of pan seared sea bass was great except for the chewiness on the skin. There was also the Aussie Swiss Chicken (澳洲瑞士雞) which was nothing spectacular except with a piece of ham and cheese melted on the grilled chicken. This was served with some onion sauce. The next dish that caught my confusion was the Onion Monegasque (摩納哥酸甜洋蔥). 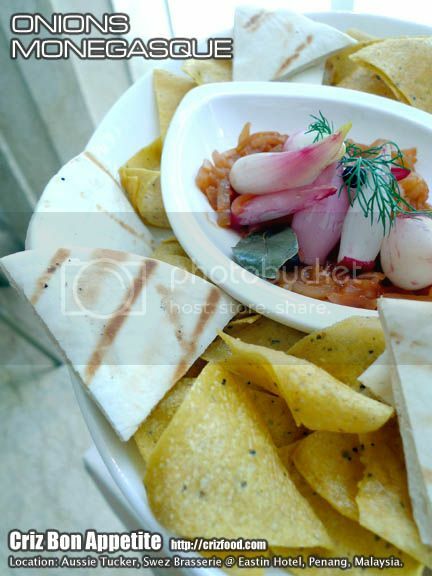 Do those people in Monaco really take Corn Tortilla or Pita Bread with this dish as a main course? It seemed to be rather light to me. Compared to the Texan’s Chili Con Carne, this dish was rather too mild for my liking. At least the former had some minced meat in it to fill up the stomach. 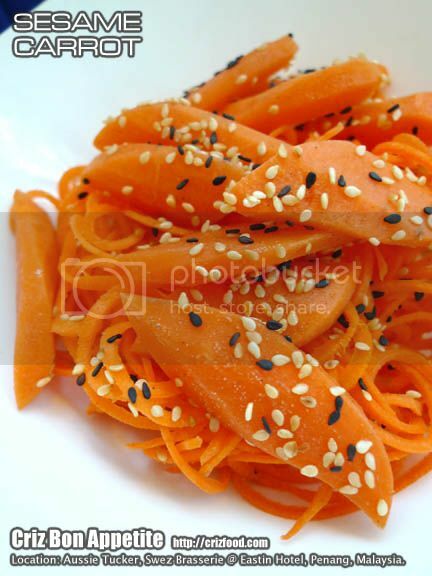 Sesame Carrot (芝麻胡蘿蔔) was also available but it was nothing special except for some toasted white and black sesame seeds garnished on some julienned and sliced carrot. It was not as crisp as it should be with some traces of frost bite softness. There were no dressing or marinate at all. The Australia originated Lamington Cake (拉明頓蛋糕) was also served to us as dessert. 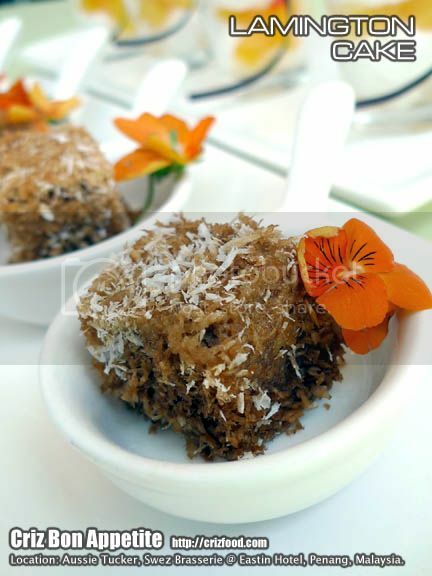 This delicacy basically consisted of squares of coffee flavored sponge cake, coated with a thin layer of ganache prior to being tossed in desiccated coconut. They were quite nice but it would be better if there were some cream/jam filling as I had tried elsewhere. Another great Australian dessert would be the Pavlova (帕芙洛娃甜餅), a meringue dessert with a crisp crust and a light inner softness. However, what we had was something I was not sure of its origin. We had Poached Meringue with Fresh Fruits instead. 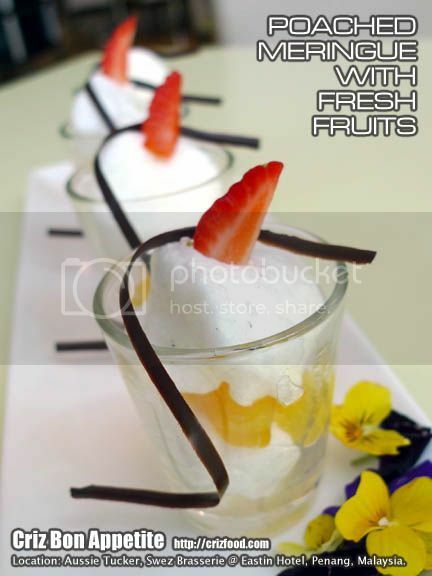 The poached meringue had the texture almost similar to a softer version of marshmallow, soaked in some canned fruits syrup and garnished with some fresh fruit cuts. Though rather unique, some were not in favor of such combination. Overall, the dishes served in the Aussie Tucker Promotion were somehow not up to my expectations as they lacked the true identity of nationality as I had mentioned earlier. Though some of the dishes introduced were unique, some of the dishes appeared to be quite common as you would get from the international cuisine spread. I would sincerely hope that the next promotion would be of a better standard in terms of flavors and the usage of relevant herbs and spices. For MAYBANKARD, Standard Chartered Bank and VISA card members, you can enjoy 15% discount for the Aussie Tucker Semi Buffet Dinner (Monday to Thursday) and Weekend Buffet Dinner (Friday to Sunday) from 6.30pm – 10.00pm.